Allow me a tiny I Told You So. In February, I wrote a story for SELF Magazine about the rising incidence of diseases other than Lyme that are caused by tick bites. (And told you about it here, of course.) The story highlighted one particular tickborne parasite, Babesia, and a serious problem with the infection it causes, babesiosis: that it was moving into the blood supply. We dug through FDA transcripts and CDC field reports in order to reveal that federal health authorities were very concerned about this prospect, and that more than 100 babesiosis infections caused by transfusions had already occurred — not just in the few states where the tick species carrying Babesia are found, but throughout the United States because blood products are shipped nationwide. Ours was the first reporting we could find about babesiosis in the blood supply, and it didn’t get the attention it should have, probably because women’s magazines tend to be dismissed as not-serious — even though SELF’s health and medical reporting has won prizes and been turned intobooks. But based on research released this morning, our story at SELF wasn’t hyping the problem. If anything, we understated it. OK, enough infomercial. Here’s the news: In a paper released ahead-of-print by the Annals of Internal Medicine, researchers from the Centers for Disease Control and Prevention, Rhode Island and New York State report that 159 cases of babesiosis were caused by transfusions in the past 30 years and “the risk may be increasing.” Twenty-seven of the patients died. Cases occurred in 19 states, but 87 percent of them were in the 7 states where Babesia is considered to be endemic — which the authors say may represent higher risk, or perhaps just greater awareness. To the right, you can see a breakdown of 141 of the cases they analyzed, broken down by year of diagnosis and also by state where the case was discovered. (They are looking at 141, not 162, because they did not analyze multiple cases from the same donor.) You can see that the trend line is rising — and also where transfusion cases were found outside of the seven endemic states in the Northeast and upper Midwest. 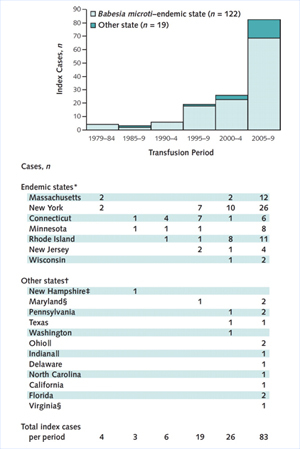 The 162 transfusion-associated cases we enumerated undoubtedly represent a fraction of those that occurred. The extent to which cases were not detected, investigated, or reported (to the CDC, to other public health authorities, or in publications) is unknown, both in general and with respect to periods, regions, and various case characteristics and outcomes. As underscored by the incidental diagnosis of Babesia infection, even severe cases in babesiosis-endemic regions can be missed or misdiagnosed, not just cases that are asymptomatic or mild or that occur in other U.S. regions. Even if a case is diagnosed, a transfusion investigation might not be considered, conducted, completed, or conclusive… Our findings underscore the year-round vulnerability of the U.S. blood supply—especially, but not only, in and near babesiosis-endemic areas. Some details first about the organism: Babesia microti (and the related B. duncani) are parasites that take up residence in red blood cells. One prominent researcher, not part of this paper, has called it “America’s malaria” – and like malaria, it causes flu-like chills and fever, and so is often ignored or misdiagnosed. But, also like malaria, it can cause anemia, organ failure and death. Eaxctly how much babesiosis is there in the US? That’s hard to say. Public health authorities have perceived the risk growing for several years, but it was only this past January that the illness became a reportable disease — meaning that, if a physician diagnoses it in a patient, he or she is supposed to pass news of the case up the hierarchy to a state health department, who pass it on to the CDC. Since the parasite travels in red blood cells, you can see how it might be a transfusion risk. But just how much of a risk it poses, and what to do about it, has been sparking sharp debate for a number of years. (Here are the minutes from an FDA meeting in 2008, and an FDA summary of the issue from 2010.) The American Association of Blood Banks declared babesiosis in blood a top priority back in 2009. At the moment, potential donors get asked: “Have you ever had babesiosis?” But most people don’t know the illness exists, and because it can be asymptomatic, people can be infected and not know it. Moreover, babesiosis isn’t something you can diagnose by looking at a blood donor. If someone is infected and experiencing symptoms, those symptoms are likely to be nonspecific — so what might indicate babesiosis might also indicate flu, or a cold, or a number of viral illnesses. But if you ruled out blood donors on the possibility they might have a cold, you’d quickly cut the US blood supply to unsustainable levels. What is not acceptable, however, is the status quo. With reports of 162 transfusion-associated cases of babesiosis probably representing only a fraction of actual cases and a potential causal or contributory role for babesiosis in the deaths of B. microti–infected blood recipients, the time to act is now.